Do your parking lots still need attention with all the time changes? At Quality Electric, we think of ourselves as the single solution for all of your commercial electricity needs. From small repairs to total building wiring, we have the experience necessary to do it all for your business. When you partner with Quality Electric, you have our years of experience on your side. We have served the Columbus area for more than two decades and have a vast knowledge of commercial electric needs. Our background can help inform electrical decisions for your business to maximize form and function. We’ll help you understand what best suits your needs, explain the process, and give you an upfront cost. We never incorporate hidden fees, and we believe that businesses always know best. We are just here to help. We offer a 1 year warranty on all electrical work! As business owners ourselves, we understand just how big an impact electrical issues can have on your overall productivity. With this in mind, we offer commercial service and repairs to our commercial clients. This unique service policy ensures you get the repairs you need done quickly, so you can get back to work as soon as possible. Does Your Business Need Lighting? 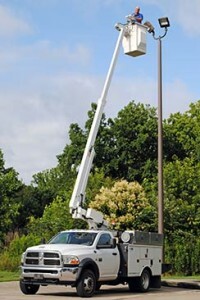 Quality Electric provides the most efficient lighting solutions for your business. Our energy-efficient options can help you reduce costs and decrease your monthly bills. We will meet with you to understand your requirements and goals for the lighting installation or upgrades, and then devise the perfect lighting solution. Our team can create a custom lighting design to meet your specifications, provide recommendations to make your current setup more energy efficient, and provide all necessary maintenance and service. Let Quality Electric get your business ready for success. Having efficient electricity lets you focus on your business and minimize any concerns with technology. We’re bonded, licensed, and insured and ready to help you with anything you need. Call today!